Viktoria Wargo, a teacher at Triangle Elementary School specializing in Autism, has received the honor of being named Somerset County Teacher of the Year for 2018-2019 because of her outstanding level of talent and commitment to the Hillsborough School District. Viktoria organizes annual activities and created a documentary film “Touched by Autism”, to spread Autism Awareness. She is an advocate for her students and all students with disabilities. Each year 21 teachers are chosen by their schools for the Governor’s Educator of the Year program acknowledging: their student achievement and student success, hard work and dedication, rewards of teaching, and important service outside the classroom. 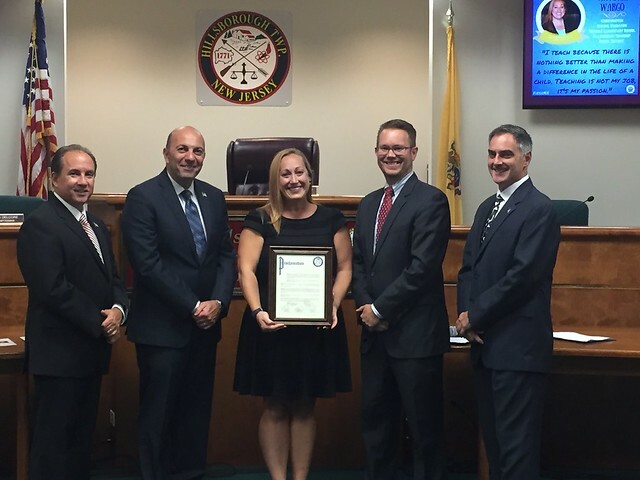 The Hillsborough Township Committee commends Viktoria Wargo for being recognized as Somerset County’s Teacher of the Year and we thank her for all her work and dedication to the youth of Hillsborough.